Any body test the differece between L3G4200D and ITG3200? Hi all. Sorry im a novice. Could someone advise if this could be used with any I/O board? I have purchased a digibee+ and since then have found this site. I have managed to hook digibee+ up to PC and can control it through Visual basic, but in terms of connecting something like this, to be quite honest, i dont know where to start. If anyone could recommend a good tutorial that would be appreciated. We are having problems running the code given above. Accidently the 5V and GND were connected opposite for 3-4 seconds. There was no visible damage. How can we test if our device is still functional? Aren't there any inbuilt safety measures for such cases? So this is what 'wide supply voltage' means now -- an entire VOLT of range! But not two volts. They didn't want to go nuts. this is a bit expensive? The chip is only $12 in qty 1 and $6 if you buy 1000. I get SF has to make money but I see this being a $25 board not $50. have you considered the fact that the board has to be designed, time has to be spent, its not just 12$ for the chip, it also price for design, for assembly, for soldring equipment, energy, + risk amount from failed parts, from the parts returned. The datasheet says degree per seconds, but it seems to me that it's radiant per second. Can anyone confirm ? The output values are scaled according to the sensitivity you select. At 250dps sensitivity, you must multiply by .00875 to get degrees per second. Link to decent datasheet: http://www.parallax.com/portals/0/downloads/docs/prod/sens/27911-GyroscopeAppNote2.pdf EDIT: actually, jstwinkles has got a better one above, my bad. Please update the datasheet link. The one you have posted is super old and doesn't even have a register map. Any chance of selling the sensor alone? I think this device is intented to be a slave of a MCU, so, why put pull-up resistors in this board if probably the master can have it? 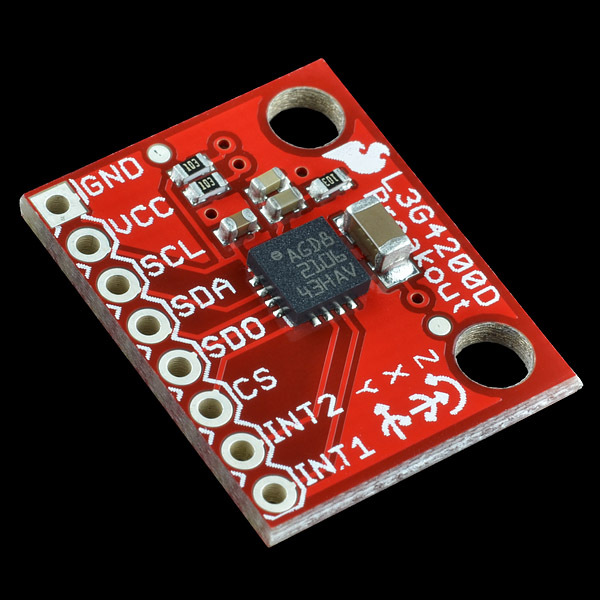 This sensor has a temperature sensor, but the datasheet nor the tutorials speak of it :( Any idea what the purpose of this is? More importantly, how do you read it? The sheet available now shows OUT_TEMP at register 0x26, with a sensitivity of one bit change per degree C. It's probably used internally to keep the readings steady despite changing temperature. 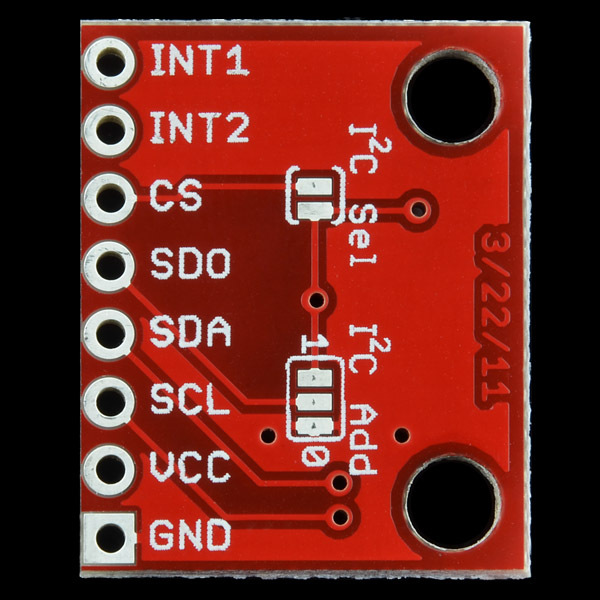 If you are using this board in SPI mode be sure to take off the 10K pull up resistors from the SDA/SDI and SCL line. I had problems communicating with the device in their presence. I have adapted the example code to work with STM32-H103 and am doing the exact same thing as the example with different commands. However my SDO line is showing no output. I am operating it with MSBfirst in the correct modes and phase as per the datasheet @ 1.25MHz. Am I missing something in the way it is initialized, or a trick in the way spi is setup thats causing it? Is there any way to determine if the chip is functional? I am also having the same problem getting this to work in SPI mode, SDO line does not seem to respond. I am trying to get the gyro working (self assembled). Can anyone check if this should return the who_am_I message? Also, you might consider the ITG3200, which I believe does simultaneous sampling internally. We tried. If we can find one we'll sell it. In the meantime, we still have a number of analog gyros, just no 3-axis ones. 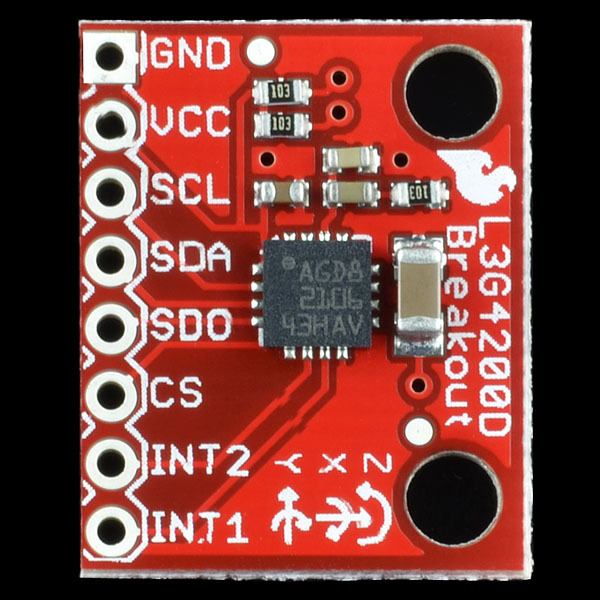 A breakout-board with invensenses idg-500 AND isz-500 would be awesome!!! does anyone know / have tested this device in a autopilot or as a quad stabilization unit? if so did it hold up well to the vibration? Hi, missing datasheet link ?? 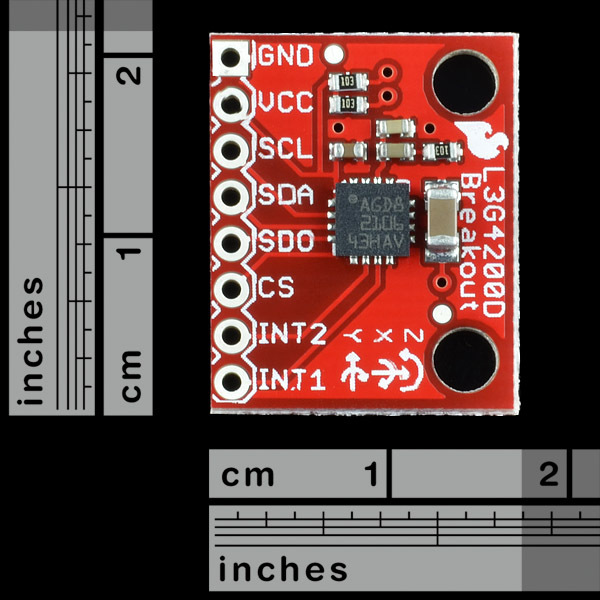 Is there a datasheet out there with a register map? I may be missing something obvious: output from this example code is in degrees per second, or is it in 10's of degrees per second? And does that value change as you change the full scale selection? If you move from 250 dps to 2000 dps, is the output still in 10's of dps? According to the data sheet, at 2000dps use a scale factor of 70x10-3 dps/digit which gives a range of +/-28572 , ie., a value of 285 is roughly 20dps. They give no information in the datasheet concerning vibrating frequency. Any hint ?